Home Camera Dji Review Dji Spark Review - The Best Mini Drone? Dji Spark Review - The Best Mini Drone? Dji Spark is the latest drone of Dji company and also the first mini quadcopter of Dji. Spark much smaller than other quadcopters on the market; the body is about the size and weight of a can of the Cross. With a starting price of just $499 (about £390, AU$670), it’s also priced right to be DJI and the industry’s most approachable drone yet for mainstream users. Dji Spark shoots HD video, has a 2-axis gimbal stabilizer on the camera, and comes with on-board software that mitigates shake and shutter roll. It tops out at 31 mph and stays aloft for 16 minutes. Not crazy-bonkers specs, but it is just so, so tiny. DJI has been making waves in the drone market for some time now, arguably never more so than when it launched the Mavic Pro last year. It is a drone packed with all the smartest sensors and tech, but also folds so small it can fit in your backpack. 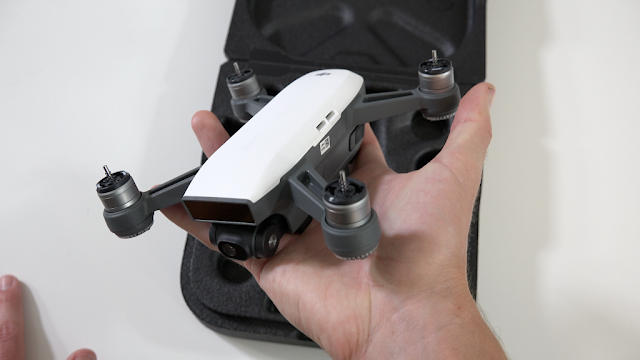 This latest drone [Dji Spark] essentially looks like a much smaller version of the Mavic Pro and, somehow, has many of the same technologies built in. Related; "DJI Mavic Pro review: The Best Drone Or Just a Joke!" The company describes the quadcopter as a lifestyle accessory that you can take with you anywhere. And, with it weighing just 300 grams, it won't be a burden, regardless of how you carry it. What's more, when it launches from your hand, it automatically enters Gesture Mode, so you can control it with hand gestures. It’s no joke that the DJI Spark is as small as a can of soda. Measuring in at a scant 143 x 143 x 55mm and 300 grams (10.6 ounces), the mini drone is something you can easily stuff into any bag or even hang off the back of your belt. While the Sparks limbs don’t fold into the drone like the Mavic Pro and GoPro Karma Drone, you can collapse the propellers that lock into place when the rotors start spinning. During our hands-on event, we slipped the drone into its optional charging case and found it was no bigger than a pair of collapsible headphones we would normal put in our bags. Dji Spark colors: Alpine White, Sky Blue, Meadow Green, Lava Red and Sunrise Yellow. The splash of color is welcome piece of personalization in a world of drones that have thus far been a mix of gray, white and black. 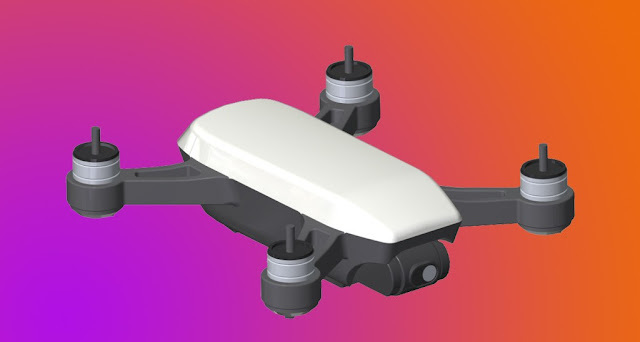 Dji Spark camera is equipped with an 12-megapixel 1/2.3-inch CMOS sensor that can capture Full HD video at 30p and 3,968 x× 2,976 resolution images. In front of the digital sensor is a 25mm lens (35mm equivalent) that captures an effective 81.8-degree field-of-view. I expected it to be way inferior to the Mavic Pro, which I own, but was pleasantly surprised with crisp, colorful and well-exposed images. The Mavic shoots in 4K, but the Spark footage looks great. It’s a step down from the DJI Mavic Pro and GoPro Karma Drone, which can all record video at 4K resolution. We would say this is an unfortunate downside of the entry-level price but the equally-priced Yuneec 4K Breeze can also shoot Ultra HD video – admittedly while sporting many fewer features. 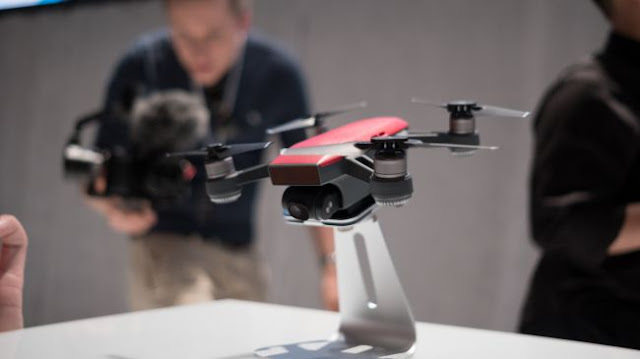 The Spark is aimed at the dronie crowd, but shares tech from the Mavic such as obstacle detection, dual-band GPS and a visual positioning system that lets it hover in place up to 98 feet (30 m) above the ground -- indoors or outside. Also, while the competition relies on electronic image stabilization alone, DJI put the Spark's full HD video camera on a two-axis motorized gimbal for smooth results without sacrificing image quality. And DJI took its gesture controls to the next level with the drone, too. DJI is promising up to 16 minutes of flight time, which is under best-case-scenario flight. You can either use a charging cradle that comes with the Fly More Combo pack or the Micro USB charging port directly on the drone. In real-world flight, I was seeing anywhere between 10 to 14 minutes of flight time, which isn’t amazing. Charging the batteries can take quite a long time, too, so it’s definitely worth investing in spare batteries. But at £55 a pop, these can be quite expensive. Again, it makes the Fly More Combo pack a more tantalising prospect. I’ve definitely found the limited battery life a hindrance, even when I was carrying three batteries with me and it’s one of the DJI Spark’s biggest weaknesses. 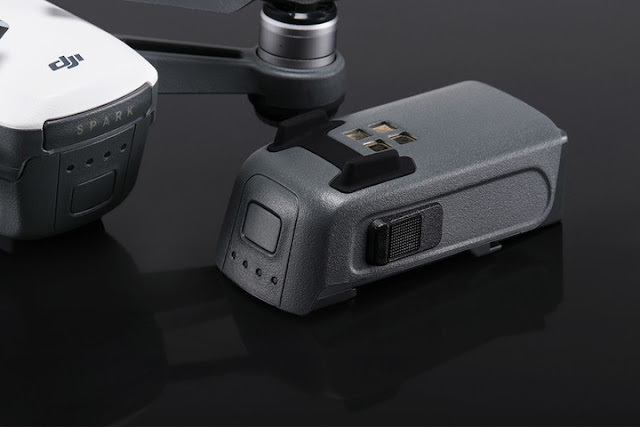 As with other DJI drones, there's also the TapFly and ActiveTrack modes. 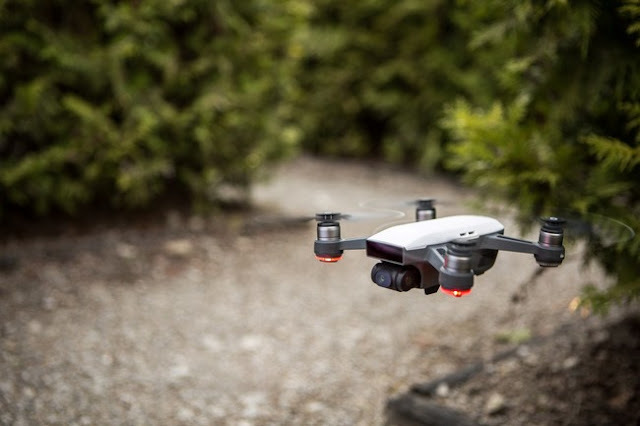 The former lets you tell the drone which way to fly, or a specific location to fly too. The latter is the awesome technology that locks the drone's vision on to a specific object, and then track it. For the brave, there's the Sport mode which can kick the Spark up to 31mph. 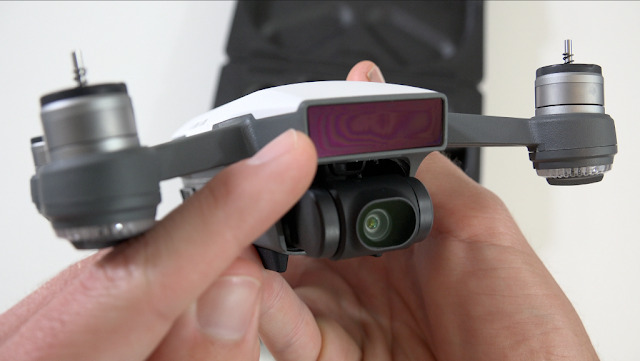 In this mode, the camera moves to its first person view by default and will be compatible with the DJI Goggles for real-time FPV footage beamed straight to your eyeballs. Each battery is built to last up to 16 minutes of flight time, which isn't at all bad given its size. There are some automated software controls in the companion app as well. QuickShots, a series of pre-determined, dramatic action shots, let you command the Spark with one tap in an app. Make it do an overhead zoom-out, a sweeping crane shot, or a circular orbit. You end up with a complex, epic-looking shot that you can edit and share right from the app. 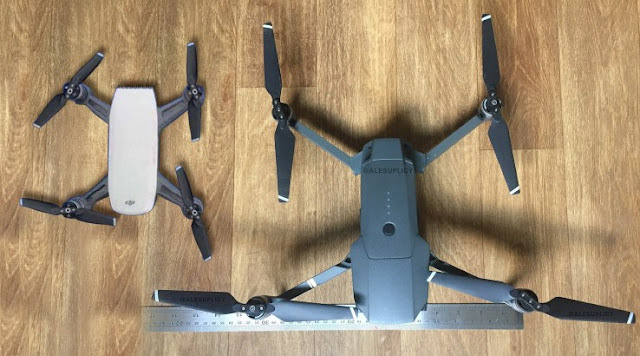 The Vps range in Dji spark is about 30 M and Transmission Dianstance is 1.2Mi ( About 2 KM ). The speed of Spark is 50KM/H [Say Dji]. So, how Dji Spark work! It's very easy when you’re ready to fly, you turn on the unit, hold the Spark in front of you, with the lens facing your face, click the battery button twice, and await for it to learn about you. From there, the propellers start to twirl, and you throw it in the air, like a bird master. The Spark hovers by you, until you direct it with your palm for which way to go--up, down, left or right. You can also wave at the drone to have it follow you in a circle. The DJI Spark is incredibly good fun to fly, and the Quick Shots are a great way to achieve dramatic shots without needing being an advanced drone pilot. The palm controls, when they work, are also great. Hopefully the kinks will get ironed out in future software updates to make it more reliable. Priced at $499 in the US, AU$859 in Australia and £519 in the UK, you don't get much more than the drone and a single battery. 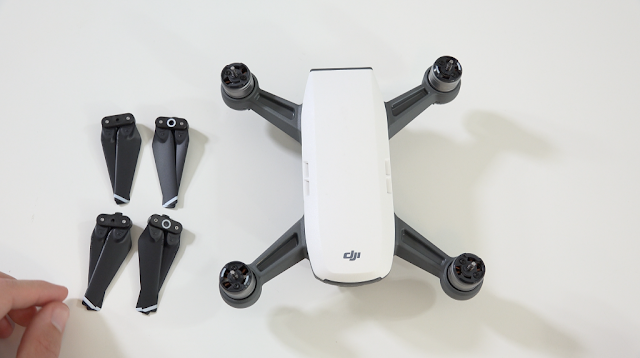 For $699 (AU$1,199, £699), DJI bundles the Spark, extra props and a set of prop guards, two batteries and a charging hub for refreshing three batteries at once, a remote controller and a carry bag -- a savings of $154, according to DJI's site. See you next time😇. Share it with your friend! If you think this article "Dji Spark Review - The Best Mini Drone? its useful share it with your friends and be one of My Drone Review Family by a Quick Subscribe! Check out my new video Dji Spark video test https://youtu.be/3MsA70Qrx4Q. Air drones are the result of the latest technology and many people taking advantages from this air drones technology some of them using these drones for film making and some of other using these drones for supplying the packaging, but most of them using the mini air drone for making the best movie clips from the sky.